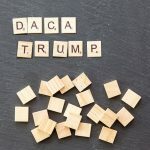 The Trump administration recently announced a repeal of the Deferred Action for Childhood Arrivals (DACA) program which shelters young undocumented people who were brought to the U.S. as children, in good standing with the law and who are educated. There are 800,000 of these Dreamers throughout the country and 18,000 of them reside in Washington state. KBCS’s Yuko Kodama spoke with Community to Community and Detention Watch Network Community organizer and DACA recipient, Jose Manuel Carillo yesterday about how the repeal of the DACA program impacts the national conversation on immigration policy.